Welcome to the 697th Edition of my series. As many know, I recently made quite the sacrifice with my hair for authenticity for my role of as the religious obsessed marine Lieutenant Kendrick. The show is getting closer so if you are close, come out to the Marion Civic Theater to see A FEW GOOD MEN. 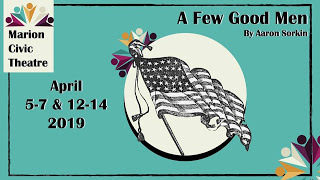 Show dates are April 5-7 and April 12-14 with Friday and Saturday shows being at 7:30 pm and Sunday matinees at 2:00 pm. Tickets are $12 and $10 for students and seniors. Nothing else going on so I'll just get on with my selections for the week. 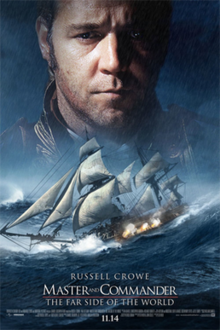 Master and Commander: The Far Side of the World (2003): Peter Weir directed this film based on the novels by Patrick O'Brian. This takes place during the Napoleonic Wars on the H.M.S. Surprise frigate that is under the command of Captain Jack Aubrey. They are under orders to find and destroy a French privateer called Acheron which they learn is a bigger and faster ship. They must plan for this encounter which puts Aubrey at odds with his trusted adviser Stephen Maturin, played by Paul Bettany, and leads to quite the climax. James D'Arcy, Chris Larkin, Max Pirkis, Max Benitz, Lee Ingleby, Robert Pugh, Ian Mercer, David Threlfall, Billy Boyd, Joseph Morgan, and many others co-star in this film. Crowe leads this movie very well and is very realistic looking as the actors were put through training on what to do on a frigate. Crowe also shows his musical talents when learning to play the violin in some scenes. Take a look, it will be worth it to go to the other side of the world for a couple hours. Bohemian Rhapsody (2018): Now I go to a music biopic which was directed by Bryan Singer. Rami Malek stars in this movie as Farrokh Bulsara who would go onto be known as Freddie Mercury and was a part of that band named Queen. This movie takes a look at Mercury when he first joined the band into their rise putting the focus on Mercury in his personal and professional life. Lucy Boynton, Gwilym Lee, Ben Hardy, Joseph Mazzello, Aiden Gillen, Tom Hollander, Mike Myers, Aaron McCusker, Maneka Das, Ace Bhatti, and many others co-star in this film. Malek plays Mercury to perfection. I'm sure there were flaws and I'm sure more ground could have been covered. 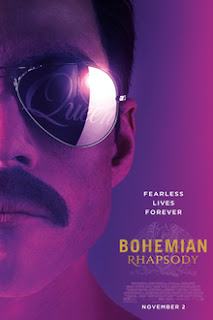 I have always been a pretty big fan of Queen and was glad to see my favorite song of theirs WHO WANTS TO LIVE FOREVER to get played in this movie. I did feel this did the band justice and was worth a look. The Stranger Beside Me (1995): I continue with this tv movie that was aired on the ABC network. Sandor Stern directed this tv movie and is based on the book EVIL BESIDE HER: THE TRUE STORY OF A TEXAS WOMAN'S MARRIAGE TO A DANGEROUS PSYCHOPATH by Kathryn Casey which is based on a true story. SAVED BY THE BELL alum Tiffani-Amber Thiesssen stars as Jennifer who meets a man named Chris, played by Eric Close, and falls in love rather quickly. He convinces Jennifer to marry him and as their marriage goes along, she starts to see a much darker side to him and also starts to believe he is the one that is committing a string of rapes within the town. Lorrie Morgan, Steven Eckholdt, Casey Sandor, Alyson Hannigan, Gary Grubbs, Gerald McRaney, and many others co-star in this tv movie. This is a pretty decent thriller with a really good performance from Close. This can be watched on Youtube. What Makes Us Tick (1952): This is my animated short for the week. This is a John Sutherland produced cartoon and he was known for his industrial cartoons from this era. This is a pro-capitalist animated short that talks about the economic system and produced by the New York Stock Exchange. Nothing great, nothing bad, of interest to see this industrial short from this era. This is available on Amazon Prime as part of "American Cold War Cartoons". The Man Who Knew Too Much (1934): This is some early work from Alfred Hitchcock. Leslie Banks and Edna Best star as married couple Bob and Jill Lawrence who receive a clue about an assassination plot only to learn their daughter Betty, played by Nova Pilbeam, has been kidnapped to keep them silent. Peter Lorre, Frank Vosper, Hugh Wakefield, Pierre Fresnay, Cicely Oates, and many others co-star in this film. 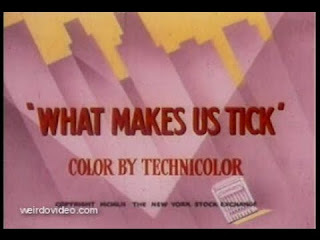 This is the only movie that Hitchcock would go onto remake which was an American version in 1956 with James Stewart and Doris Day which I admit is the version I like better which is really more of my preference to the Master of Suspense in general. 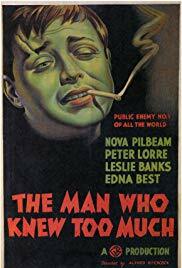 This is still a pretty good British film and a good performance out of Peter Lorre which is his first English speaking film. This is available to watch on Hoopla Digital. 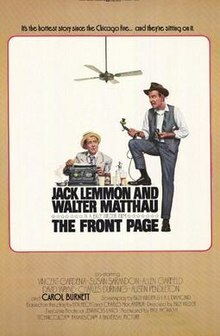 The Front Page (1974): Billy Wilder directed this remake of the 1931 movie which is based on the play by Ben Hecht and Charles MacArthur. Walter Matthau stars as tabloid editor Walter Burns whose top reporter Hildy Johnson is leaving to get married to his fiance Peggy, played by Susan Sarandon. Things become more complicated when an escaped death row convict comes to the station conveying his innocence and Walter trying to get a good story. Vincent Gardenia, David Wayne, Allen Garfield, Austin Pendleton, Charles Durning, Herb Edelman, Martin Gabel, Harold Gould, Carol Burnett, Paul Benedict, and many others co-star in this comedy. This is the third pairing of Lemmon and Matthau out of ten pairings. This has a really good blend of comedy and drama and worth a look. This is available to watch on Hoopla Digital. Con Air (1997): This is part three of my four-part Steve Buscemi series. Simon West directed this action film. Nicolas Cage stars as the newly paroled Cameron Poe who is looking to get back with his wife and daughter that he has not yet met. 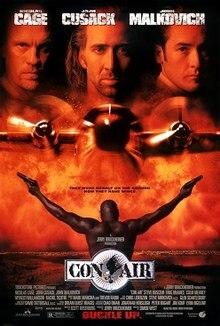 He must take a prison airplane with some of the world's most dangerous criminals and the plane gets hijacked getting lead by Cyrus, played by John Malkovich. John Cusack stars as United States Marshal Vince Larkin who looks to stop the situation from the ground and believes through Poe's track record that he has an ally to help stop the hijacking. Ving Rhames, Danny Trejo, Rachel Ticotin, M.C. 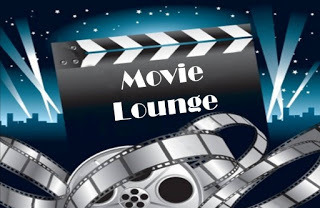 Gainey, Monica Potter, Landry Allbright, Colm Meaney, Dave Chappelle, and many others co-star in this action film. This is more of a guilty pleasure and adrenaline rush more than anything for me. If looking for anything realistic, this is really not the one to watch. Just watch this for what it is, a movie of fun characters and over the top action. Detour (1945): I continue with this film noir which was directed by Edgar G. Ulmer. Tom Neal stars as Al Roberts who works in New York as a nightclub pianist and looks to join his girl Sue, played by Claudia Drake in Los Angeles where she is trying to make it as an actress. To get there, he decides to hitchhike where he meets two of the wrongest people he could ever meet in gambler Charles Haskell, played by Edmund MacDonald, and blackmailing femme fatale Vera, played by Ann Savage. 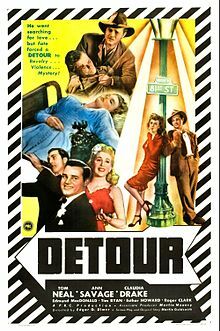 This is probably consider a B list film noir but is possibly the most known of them all. It has gone onto have a bit of a cult following and still remains very compelling with a pretty memorable ending in my mind. This is available on Amazon Prime and is only a little over an hour long. 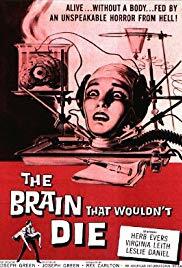 The Brain that Wouldn't Die (1962): Now I go to B movie film noir to B movie sci-fi which was directed by Joseph Green. Herb Evers stars as Frankenstein-esque Doctor Bill Cortner who is experimenting with transport techniques and whose girlfriend's head, played by Virginia Leith, is decapitated in a car accident and manages to keep the head alive while looking for a body to put it upon. This has a pretty interesting premise and another that can be enjoyed if not taken too seriously. also learned that this was turned into a stage musical which also catches my interest and could be a cool October musical. This is another that is available to watch on Amazon Prime. Brutal Beauty: Tales of the Rose City Rollers (2010): I end the week with this documentary which is directed by Chip Mabry. This centers around the world of roller derby documenting a roller derby team in Portland, Oregon. It centers most around the players and their actual personalities to their alter-egos in derby. I have come to enjoy going to see my own local roller derby team in Muncie called the Cornfed Derby Dames which I got to see last night. I have thought about volunteering to be a referee but I'm to much into the theater to make a commitment. It does kind of remind me of the world of independent wrestling though and this movie conveys it as well where everyday people take part in something unusual like this sport. This was something that was popular in the '70s but has gained quite a resurgence through the last few years. This could be a good double feature to go along with the 2009 film WHIP IT which is a fictional movie about roller derby.